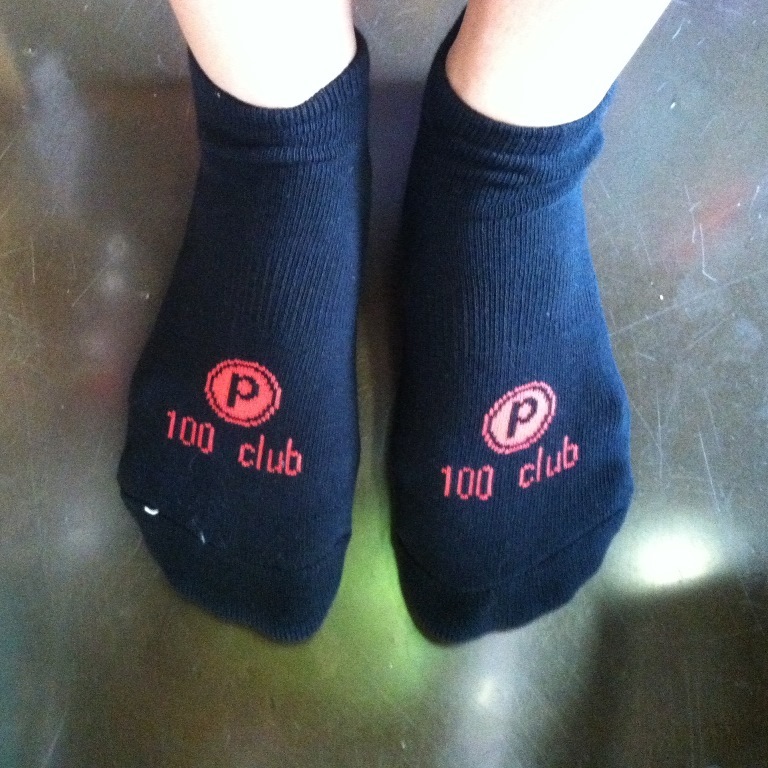 Well, I made it to 100 Pure Barre classes and got my coveted “100 Club” socks. Woo-hoo! I actually made it in back on October 9, but like most things lately, I’m super behind on posting about it. I am pretty proud of myself for sticking with it for so long and have a goal to be in the 200 Club by next February. I’m already almost halfway there, but I know when the baby gets here, I won’t have as much time to go for a while. So, gotta get as many as I can in before June and then take advantage of those lunchtime classes in the fall & winter. I have come a really long way since my first few Pure Barre classes and I wanted to share some of the tips I’ve picked up. I was really bad when I first started taking classes. Like, being corrected 20 times a class bad, haha. But, after a while, something clicked and I began to get the hang of it. I’m by no means a Pure Barre expert, but I thought maybe I could share some advice. If you’re just starting to take Pure Barre classes, I say don’t give up! Every instructor is different, so every class is different. If you’re considering taking classes, then I recommend taking Tylonel or Advil before you go to bed on the night after your first class, because trust me, you’re gonna need it. Anyway, I’m not an instructor, so please keep that in mind if you read on. These are just some tips and tricks I’ve picked up over the course of my 100+ classes. If you have any questions on form, the best thing to do is ask your instructor. Happy LTB’ing! 2. Don’t compare yourself to fellow classmates – Everyone is at a different level. Who cares if the girl next to you can lift her leg up higher? It’s about length, not height. Seriously. We all are spastic when attempting to do certain moves. Worry only about yourself and you’ll get a much better burn. 3. During slower ab sprints, the “C” curve is your friend – If you’re like me and not very flexible, make sure you’ve got a really strong “C” curve in your back during the slower (first part) of ab sprints. It’ll help you left your leg up higher. 4. Let the instructor help you – Don’t get embarrassed if you’re being constantly corrected during class. I used to get corrected what felt like 100 times a class and be so embarrassed about it. Now, I thank the instructor and consciously focus on correcting myself and making sure it doesn’t happen again. Take advantage of the mirrors to check your form. 5. Small movements – Smaller is better; you don’t have to exaggerate your movements to prove to the instructor that you’re doing them. They’re supposed to be isometric and she’s trained to look for them. If you’re going big, you’re probably doing it wrong. 6. Listen to your body – If you have to rest, rest. If you have to come down on your knees while doing a plank or push-ups, there is no shame in that. 7. Go for the Final 10 – You can do anything for ten seconds! Make those last ten count. Honestly, if I’m dying and know when the instructor says “final 30 seconds” that I can’t hold the position for 30 more seconds, I get through 10 seconds, rest for 5 seconds, then get back up and make sure that I do that final 10. For me, it feels better to be able to do those last 10 vs. burning out and stopping with 15 seconds to go. 8. Let the rhythm be your guide – It’s a lot easier to count if you use the beat of the music as a guide. The sprints will also go by a lot quicker if you enjoy the music. 9. Take the Pure Barre 101 class – I took it a few months ago and learned a lot, even though I wasn’t a Pure Barre newbie. It cemented a lot of form-related things for me. For instance, if you start off with your feet in parallel, you’ll most likely be moving your leg straight back. If you start with your heels together and toes apart, you’ll most likely be angling your leg out behind you to the side. 10. Leave your cell phones at the door – I’m totally guilty of not being able to fully unplug or focus on just one thing; I once studied for a test during a 6 a.m. Pilates class (yeah, I know…). But, I made a pact with myself to never bring my iPhone into Pure Barre class with me. Classes are intimate, intense and hell yeah, they’re freaking expensive. Get the most of your time and money. Eliminate potential distractions like your phone. Of course, there will be times when real life things make it hard to concentrate, but try to clear your mind and listen to the cues that the instructor gives, check your form in the mirror, close your eyes, and focus on doing each exercise to the fullest. If your mind wandered briefly and you did miss a cue, you can always refer to the form of another instructor who is taking the class. I don’t know about every Pure Barre studio, but I’d say 8 out of 10 classes I go to will have another instructor taking a class and I’ve been guilty of peeking at their form in the mirror before to make sure I’m in the correct position. *Bonus Tip* – Don’t forget to have fun! This entry was posted in Fitness and tagged Fitness, fitness tips, Lift Tone Burn, Pure Barre, Pure Barre 100 Club, Pure Barre Tips. Bookmark the permalink.